For years, especially since the release of Nintendo's controversial Zelda timeline in the Hyrule Historia (https://zelda.gamepedia.com/The_Legend_of_Zelda:_Hyrule_Historia), the idea of Zelda games sharing a lore connection has been dismissed as ridiculous or silly. The "punchline" is that Nintendo "retconned an entire timeline into a series that was obviously not meant to have one...." This tweet has almost 9,000 likes and almost 5,000 retweets. Needless to say, this is both a common perspective and a popular one. And it's, at the least, misguided. Let me be clear about my views and my intentions. First, I don't plan to defend the Hyrule Historia timeline or to craft any sort of alternative. I'm not a nut. Second, I plan on demonstrating that most of the early Zelda games had clear connections with one another; these connections were conscious and intentional; and many of these connections were also explicitly part of the marketing of these games. So far, the Zelda series seems straightforwardly chronological. 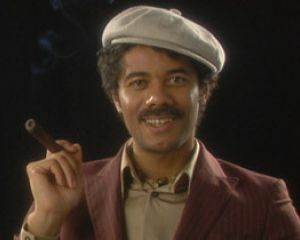 Zelda 2 is a direct sequel to Zelda 1, following the same Link after his victory over Gannon but with a different Princess Zelda. Next, let's discuss The Link to the Past (LttP). On one hand, it's true that LttP has very little in terms of direct in-game connections to The Legend of Zelda or Zelda 2. The geography seems partially inspired by the original, and you do learn more about the tri-force and Gannon. However, the game text doesn't really do more to solidify connections. "The predecessors of Link and Zelda...." is a direct reflection of this game being a prequel. 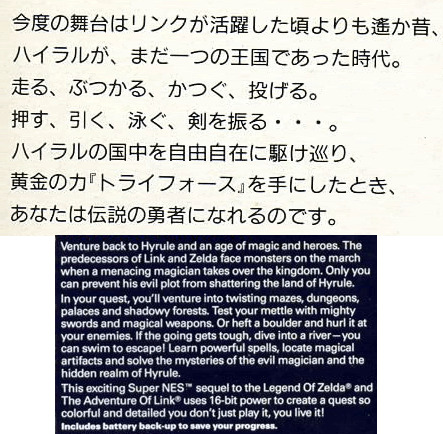 So.. Zelda LttP was explicitly marketed as a prequel to Zelda 1 and Zelda 2, while using the same language Zelda 2 used to denote its own past. Next, we have Zelda: The Ocarina of Time (TOoT). TOoT has basically the opposite problem of LttP. While LttP has few direct in-game references to Zelda 1/2, TOoT has TONS. 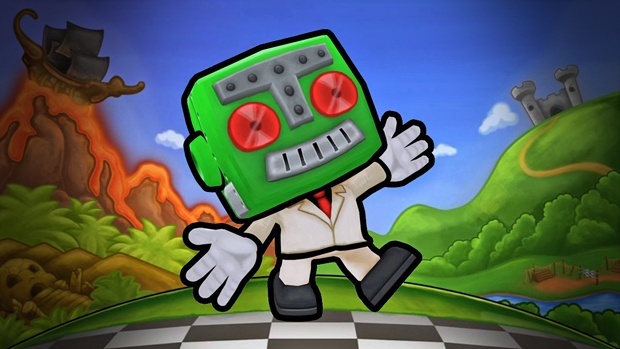 TOoT was clearly made in the hopes of filling out the lore provided in the prior three games. On the other hand, while LttP was explicitly marketed as a prequel, TOoT has no explicit references in the manual or on the box to its status vis-a-vis the other games. In all honesty, I think the fact that TOoT's connections to LttP and Zelda 2 were hidden in the game rather than made part of the marketing push has helped created the stereotype I began this piece to attack. Simply put, discussing the connections of TOoT to LttP can easily make one look like a crazy Zelda fan who has lost his/her mind. Why does this matter? The Imprisoning War is the story background of the events of LttP. To the extent that TOoT is based on The Imprisoning War, it serves as a direct prequel to the events of LttP. In fact, I think almost any broad reading of the Prologue of LttP alongside the narrative of TOoT reveals this to be utterly true. In broad strokes: Ganondorf, King of Thieves, somehow reaches the Triforce and becomes Gannon. The Hero of Time fails to appear (being a child in TOoT), which leads to the devastation of Hyrule. Finally, 7 Wise Men (Sages in Japanese and in both English and Japanese in TOoT) manage to seal Gannon away. I'd also like to point out: Toru Osawa also emphasized the connection made between TOoT and Zelda 2. TOoT was a direct prequel to LttP, but it was also set vaguely in the past of Zelda 2 as well. Just to be clear about what he's referencing, the 6 Sages of TOoT are: Rauru, Saria, Darunia, Ruto, Impa, Nabooru. Towns in Zelda 2: Raura Town, Ruto Town, Saria Town, Nabooru Town, Darunia Town. The idea is that the great figures of TOoT leave behind such an impression that the towns of the Zelda 2 era are named after them. My final obvious point is that Zelda Majora's Mask is a direct follow-up to TOoT. I don't even feel like I need to argue this. To wrap up: Zelda 2 was an explicit sequel to Zelda 1. Zelda LttP was an explicit prequel to 1 and 2. TOoT was a direct prequel to LttP (though not explicit) and had connections to Zelda 2 as well. MM was an explicit sequel to TOoT. This idea that all Zelda games are separate and unconnected and only loons would say otherwise... let's add it to the trash-heap of history. Epilogue: I will stay that, post-Majora's Mask, the continuity quickly becomes convoluted and impossible to follow. Later entries were either vaguely set before TOoT (like Skyward Sword) vaguely after TOoT (Wind Waker, Twilight Princess, Breath of the Wild) or are just flat out vague (Oracle of Ages/Seasons, Link Between Worlds). However, of the first SIX Zelda titles, five have obvious connections with one another. 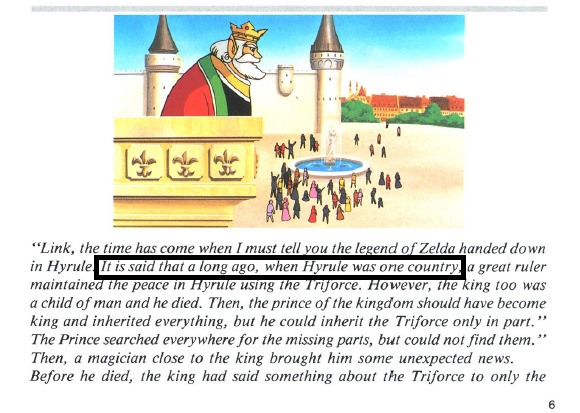 The Hyrule Historia timeline may be garbage, but dismissing these connections in the older titles is flatly incorrect.